The Japanese tea ceremony (chadō, or sadō, or chanoyu – “the way of tea”) is a traditional ritual based on Taoism (Daoism) and influenced by Zen Buddhism in which powdered green tea, or matcha, is ceremonially prepared by a skilled practitioner and served to a small group of guests in a tranquil setting. The pronunciation sadō is preferred by some schools, including Omotesenke and the Mushanokōjisenke, while the pronunciation chadō is preferred by others, including Urasenke. Cha-no-yu (literally “hot water for tea”) usually refers to either a single ceremony or ritual, while cha-ji or chakai (literally “tea meeting”) refers to a full tea ceremony with kaiseki (a light meal), usucha (thin tea) and koicha (thick tea), lasting approximately four hours. Since a tea practitioner must be familiar with the production and types of tea, with kimono, calligraphy, flower arranging, ceramics, incense and a wide range of other disciplines and traditional arts in addition to his or her school’s tea practices, the study of the tea ceremony takes many years and often lasts a lifetime. Even to participate as a guest in a formal tea ceremony requires knowledge of the prescribed gestures and phrases, the proper way to take tea and sweets, and general deportment in the tea room. Drinking of tea was introduced to Japan in the 9th century in the form of the boiled tea (dancha) by the Buddhist monk Eichu, who had returned to Japan from China, where it had already been known, according to legend, for more than a thousand years. Tea soon became widely popular in Japan, and began to be cultivated locally. The custom of drinking tea, first for medicinal, and then for purely pleasurable reasons, was already widespread throughout China. In the early 9th century, Chinese author Lu Yu wrote the Ch’a Ching (the Classic of Tea), a treatise on tea focusing on its cultivation and preparation. Lu Yu’s life had been heavily influenced by Buddhism, particularly the Zen-Chán school. (This form of buddhism is known as Chan in China and Zen in Japan). His ideas would have a strong influence in the development of the Japanese tea ceremony. In the 12th century, a new form of tea, matcha, was introduced by Eisai, another Japanese monk returning from China. This powdered green tea, which sprouts from the same plant as black tea but is unfermented and ground, was first used in religious rituals in Buddhist monasteries. By the 13th century, samurai warriors had begun preparing and drinking matcha as they adopted Zen Buddhism, and the foundations of the tea ceremony were laid. Tea ceremony developed as a “transformative practice,” and began to evolve its own aesthetic, in particular that of wabi. Wabi, meaning quiet or sober refinement, or subdued taste, “is characterized by humility, restraint, simplicity, naturalism, profundity, imperfection, and asymmetry [emphasizing] simple, unadorned objects and architectural space, and [celebrating] the mellow beauty that time and care impart to materials”. Ikkyu, who revitalized Zen in the 15th century, had a profound influence on the tea ceremony. By the 16th century, tea drinking had spread to all levels of society in Japan. Sen no Rikyu, perhaps the most well-known and still revered historical figure in tea ceremony, followed his master, Takeno Jōō’s, concept of ichi-go ichi-e, a philosophy that each meeting should be treasured, for it can never be reproduced. His teachings perfected many newly developed forms in Japanese architecture and gardens, fine and applied arts, and the full development of tea ceremony. The principles he set forward – harmony (wa), respect (kei), purity (sei), and tranquility (jaku) – are still central to tea ceremony today. Chabako demae (Omotesenke, Urasenke) is so called because the equipment is removed from and then replaced into a special box (chabako, literally tea box).This ceremony is approx 35-40 minutes. Hakobi demae (Omotesenke, Urasenke) is closely related to ryū-rei (see below), but is performed in seiza position. The name comes from the fact that the essential equipment bowl, natsume, waste water container, fresh water container, scoops, and so on – are carried into and out of the tea room. In O-bon Temae (Omotesenke, “tray ceremony” Urasenke ryaku-bon or ryaku-demae –– ryaku: “abbreviated”), the host places a tea bowl, whisk, tea scoop, chakin and natsume on a special tray; these items are covered by the fukusa. 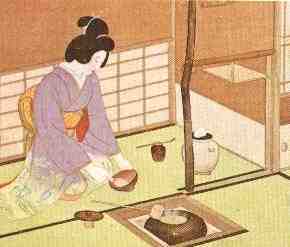 Thin tea is prepared on the tray while kneeling seiza style on the floor. This is usually the first ceremony learned, and is the simplest to perform, requiring neither much specialized equipment nor a lot of time to complete. 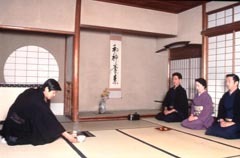 In Ryū-rei (literally standing bow) the tea is prepared at a special table. The guests are seated either at the same table (one guest) or at a separate table. The name refers to the practice of performing the first and last bows standing at the entrance to the tea room. In Ryū-rei there is usually an assistant who sits behind the host and moves the host’s stool out of the way as needed for standing or sitting. The assistant also serves the tea and sweets to the guests. Calligraphy, mainly in the form of hanging scrolls, plays a central role in the tea ceremony. In Japan the formal name for this process of brush strokes is zenga. Scrolls, often written by famous calligraphers or Buddhist monks or painted by well-known artists, are hung in the tokonoma (scroll alcove) of the tea room. They are selected for their appropriateness for the season, time of day, or theme of the particular ceremony. Calligraphic scrolls may feature well-known sayings, particularly those associated with Buddhism, poems, descriptions of famous places, or words or phrases associated with tea ceremony. A typical example might have the characters wa kei sei jaku (harmony, respect, purity and tranquility). Some contain only a single character; in summer, kaze (“wind”) would be appropriate. Painted scrolls may contain seasonally appropriate images, or images appropriate to the theme of the particular ceremony. Rabbits, for example, might be chosen for a nighttime ceremony because of their association with the moon. Scrolls are sometimes placed in the waiting room as well. A chabana flower arrangement in front of a hanging scroll. Chabana (literally “tea flowers”) is the simple style of flower arranging used in tea ceremony. Chabana has its roots in ikebana, another traditional style of Japanese flower arranging, which itself has roots in Shinto and Buddhism. At its most basic, a chabana arrangement is a simple arrangement of seasonal flowers placed in a container. Chabana arrangements typically comprise few items, and little or no “filler” material. Unlike ikebana (which often uses shallow, wide dishes), tall, narrow vases are frequently used in chabana. Vases are made from natural materials such as bamboo, as well as metal or ceramic, but rarely glass.